A Food Processor is a kitchen "work horse" used to chop, shred & slice, julienne, grate, mince, crumb, mix, cut-in, puree, mash, blend, and grind. Processors use different blades and disks than a blender to do different jobs. A blender has a fixed blade. Processor bowls are usually shaped different to be more suited to deal with solid or semi-solid foods. Blenders "shine" when it comes to liquids. At one time processors were hand-cranked! Electric motors were too expensive for many people. Today, the base of a processor holds a motor which turns a vertical shaft. The motor is usually heavy and that serves to keep a processor from "walking off" a counter top when it is operating. A bowl, usually made of clear plastic, fits around the shaft. A lid with a "feed tube" is then fitted onto the bowl. The feed tube allows ingredients to be added while chopping, grinding or pureeing. A "pusher" is provided, sized to slide through a feed tube that is designed to protect your fingers. And almost all modern food processors have safety devices that prevent the motor from operating if the bowl isn't "seated" properly on the base or the lid isn't on properly. The size of a bowl varies with the size of the machine and motor. Larger bowls run from 9 to 14 cups. Medium-size bowls can run from 5 to 7 cups. Small bowls can hold from 2 to 4 cups. Some food processors come with large and small bowls for use with the same base. The attachments fit over the shaft inside the bowl. 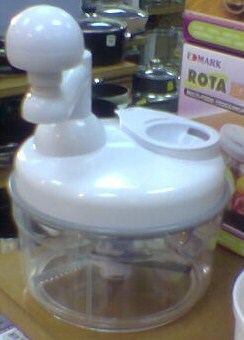 A standard attachment for a food processor is an S-shaped blade shown pictured here. This blade is usually metal or hard plastic and sits at the bottom of the bowl. I like a metal blade because it holds its sharpness longer. Shredding and slicing discs are made of metal and sit at the top of the bowl, over the shaft. As you push food down the tube it contacts the disc and is grated or sliced into the bowl depending on what disc you are using. You can purchase different versions of discs separately if they do not come with the food processor. You can also purchase extra bowls. This is handy if you are making several things at the same time. No washing between tasks. Power. Please don't consider any processor without at least 500-600 watts. Size. If you only cook for one or two or three people normally, a small unit might work fine. What foods you prepare frequently. If you make your own breads, forget the small units; you will need a large processor. Some processors have different-sized feed tubes and bowls that can be used with the same base. This is an important consideration. Ease of Use. Read about what others say for any model you are considering. Durability. See what the manufacturer's warranty says. Three years? Five years? This is a good "clue." Ease of Cleaning. Again, read what other consumers have to say about specific models. Style. If the food processor must sit on your counter all the time at least it should look decent. Now it's time for you to begin your research. What processor do I recommend? I can't say, not knowing your answers to the items listed above, but I can tell you I have used three brands at the restaurant and at home for over 30 years. RoboCoupe is a commercial processor and a good one for high volume food establishments. Home cooks really don't need one like this. But I have great experience with Cuisinart processors and some KitchenAid models, both at work and at home. A medium-size machine will save you hours of time in chopping, mixing, slicing, and shredding. It will chop meat as well. You can chop enough vegetables to fill a 4-quart stock pot in only 15 minutes. Another thing to consider is the size of the feeding tube. It should be large enough to "accept" most whole vegetables. 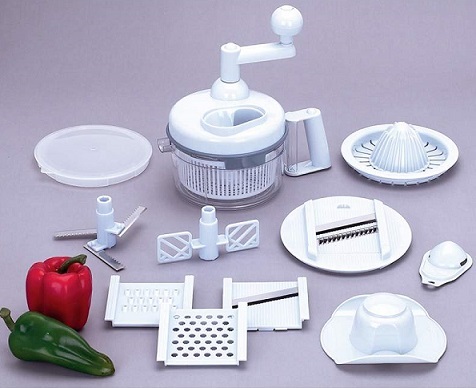 A quality Food Processor is an excellent investment for any kitchen. It can be a great time-saver. Did you know? Apparently the first electric food processors was the “Starmix” made in 1946 by Electrostar, a German company.